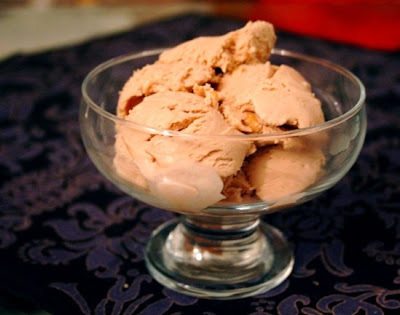 A three ingredient ice cream recipe? This ice cream has a fantastic flavor that won't give away its secret: it is sweetened and flavored entirely by candy bars. Chop each bar in four and put in pan with the milk. Heat gently, stirring frequently, until all but the peanuts remain. Remove from heat and transfer to a few inches of cold water to cool the mixture quickly. When mixture is at room temperature or colder, start the ice cream machine. 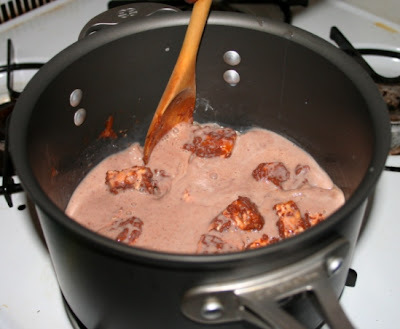 Stir the chilled cream into the milk/candy mixture and freeze according to your machine's instructions. This ice cream tasted better when it was freshly made and then frozen for about a half hour--before it had a chance to become completely solid. It had a sort of soft-serve Hoodsie like taste since it's made with milk chocolate. We couldn't stop eating it. Because it's an ice cream that's not made with eggs, when it freezes completely it has a slightly unprofessional mouth feel--the same taste you get when your whipped cream dissolves into your Starbucks Frappuccino--it sticks uncomfortably to the top of your mouth. It hardly matters though because this ice cream is so easy to make and gets consumed so quickly that it may never have the opportunity to freeze solid. Candy bars melting into milk. A note on the candy: this recipe originally called for British Mars Bars, with a side note that the American equivalent is Snickers. That's a research error in the cookbook, however. The American equivalent of a British Mars Bar is a Milky Way. That's why the original recipe mentions nothing about nuts and has you melt the candy until just a couple of chocolate bits remain. I'm certain that this recipe would be just as delicious if made with Milky Way, but the peanuts were a delicious addition: even though the candy bar melts the nuts retain some of their caramel coating. A note on the cookbook: Frozen Desserts is the best ice cream cookbook ever. The authors have tested every sort of recipe extensively, plus they give you the formulas so that you can develop your own concoctions. Candy aside, if you want a custard-based ice cream that really impresses, their Ricotta recipe can't be beat.